Last day on the trail, and I definitely have mixed feelings. I topped off my water at the bucket spring. 2.5 L, which was 1 L too much in retrospect, although I didn’t know that so many seasonal streams would be flowing. Right when I finished Terri & Ginger showed up; I headed up the hill as they were topping off. The burn resumed almost immediately after I left camp, and probably half of the day was in the burn. But that allowed for more views. Before long, I was able to see St. Helens, and then Adams. The views were opening up, and my mood got brighter and brighter. Terri and Ginger caught up to me, and we hiked together for most of the afternoon. The nice thing about “hiking together” on the PCT is that nobody is making you stay in a group. You hike at your own speed, and catch up eventually. No guilt, no fuss, lots of time for photography. One thing I did was take time to talk with people (when they wanted). I learned a lot, and really felt part of the community. We hit a point all of a sudden where we could see four volcanoes: Hood, St. Helens, Rainier, and of course Adams. It was incredible. Four at one time is pretty rare, unless you’re on a summit. Adams on the left, and Hood on the right. Hiking out of the burn. This was one of those days where you keep stopping to take pictures, and each picture gets better. The pictures through the burn made quite a contrast, and eventually there was no burn…just beautiful trees, wildflowers, and of course the ever present Adams. Mt. Adams: The Pinnacle and the White Salmon Glacier. Near the junction with the Round the Mountain Trail, which encircles Mt. Adams. Not much difficulty crossing creeks this time of year. Rockfall near the Round the Mountain trail. 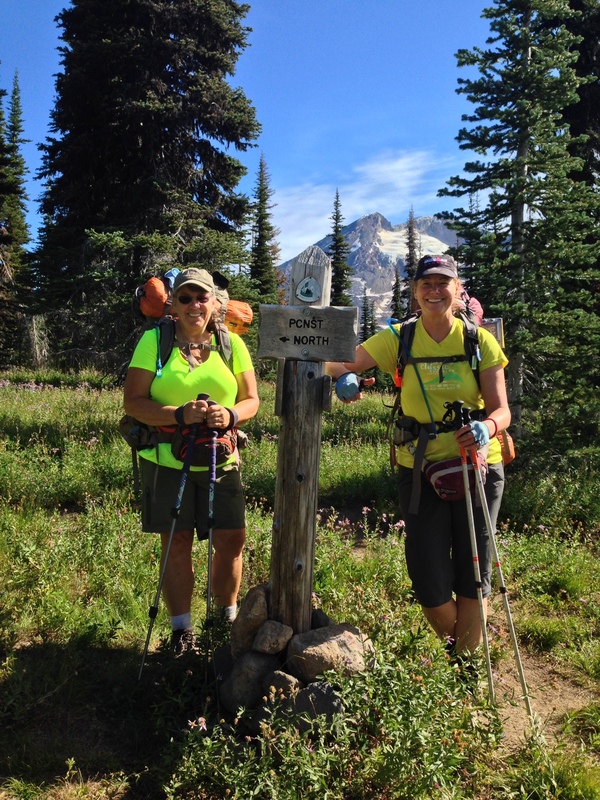 Terri & Ginger decided to camp at Riley Creek, 2237. We had lunch a few miles before, amidst the wildflowers. They were heading down the following day, so once we hit Riley we parted ways. It’s been great to have such cool hiking buddies! Firestarter (Ginger) and the Warden (Terri)! Shortly after I left Riley Creek, I began to see some of next year’s goals: Rainier and the Goat Rocks. Rainier is getting more and more visible. Next year, the Goat Rocks Wilderness. Finally, the last push. My emotions were running high. I got a few more pictures along the silty creeks, and Lewis River. Just before my exit point, I met a group from my neck of the woods; when they heard my trail name, the instant response was “Mountaineers!” We shared a lot in common, and it was a great sendoff for me. The creeks are full of glacial silt. The northwest face of Adams, and the Adams Glacier. 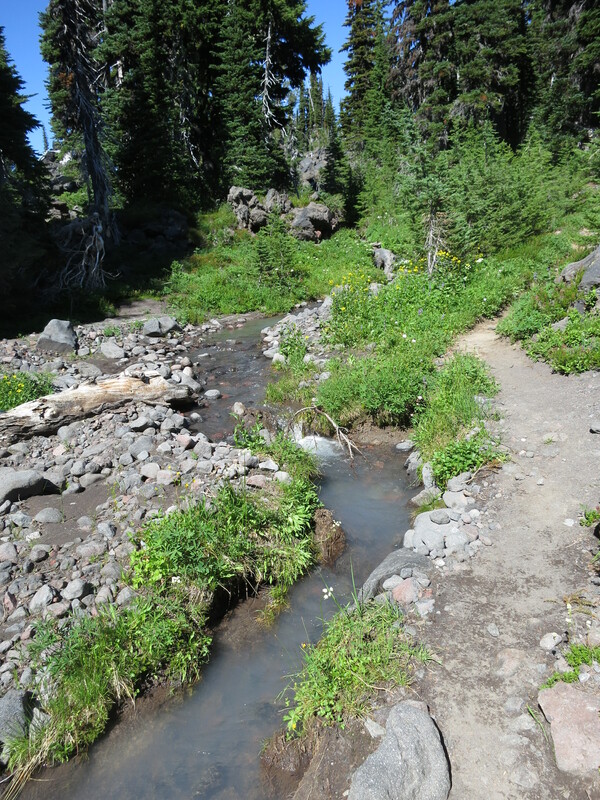 Glacial streams, Adams’ northwest side, and nearing the end of my hike. Divide Camp Trail. I cried. And took pictures of my return destination, for 2015, God willing. This is the turnoff, where I head down and join the gang at Takhlakh. Happy and sad, all jumbled together. And this is my return point for 2015, mile 2239. The trail down was just tedium…rocky and ordinary. It mellowed out to duff at the end, and then I hit the road. Left turn, and a couple of miles up the foot-pounding hardpan. Probably 5 miles altogether. Finally, the campground. I found the entrance, and the Ferrenbergs’ site. Sue & James were astounded to see me so soon, and I got a hero’s welcome! And fresh food! And then the fam arrived. This was the best. I am very blessed to have a family, and especially a husband, who are cool with my need to hike. 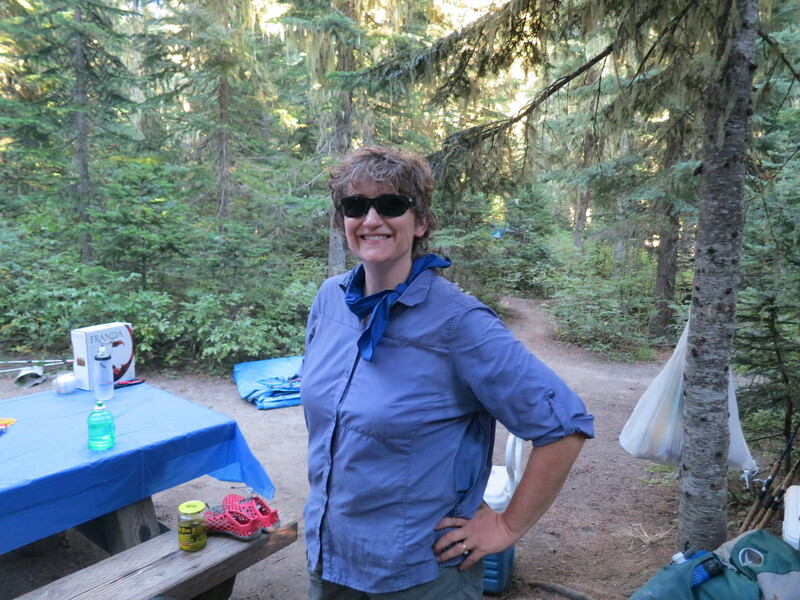 I received a very warm welcome from everyone at camp, who plied me with food, drink, and a comfy chair. And so, it ends with a few days at Takhlakh Lake. Some reminiscing, sharing a picture or two, a plan hatched for trail magic next summer while I’m hiking north. There is no way to adequately capture the experience, except to say that it was the hardest and most incredible hike ever, for me, so far. I’ve done two other long distance hikes, which both hold “best ever” status for a couple of different reasons. But this was about me, and what I could do. And I did it, glory to God. Here’s to 2014…and next year’s journey north. In July 2015, I returned to Mt. Adams, and headed north. You can follow my continuing adventures here.